Every once in a while, I get a bit antsy and just want to throw everything away and start all over again. That's when I know that it's time for Spring Cleaning and sprucing things up a bit (or a lot!) around our home. This year, I started in our downstairs powder room. To start off, I gave everything a good cleaning. I washed the walls, cleaned the toilet, sink and vanity, cleaned the window and even remembered to clean the mirror. Now for the sprucing up part....I wanted to spend as little money as possible, so first I pulled things together from other rooms in the house that I thought would work in here. I found that I was short a few things so I took a trip to the local dollar stores which are my second favorite place to go, the fabric store being my very favorite. Anyway, I digress. 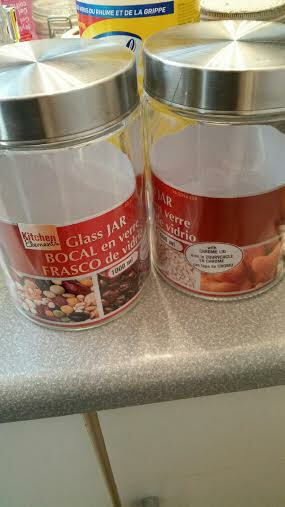 I bought 2 glass jars for $3 each at the dollar store. I already had an identical third one in my kitchen. As you can see in the "after" photo, I have denture tablets, Q-tips and cotton balls in them. The wooden vase I have had for years. I love it. My sister had given me some of her silk flowers when she moved and I used the hydrangeas in here. I bought two $3 plastic bins for under the sink. One has all our hand-towels and facecloths and the other holds 10 rolls of toilet paper. It was a nightmare under the sink before my spruce up. I was amazed at the amount of stuff shoved under there, and none of it was anything we used!! There were cleaning rags, dusting cloths, cleaning supplies, dog grooming items, first aid supplies, and I found a huge spring that no one knows what it came off as well as a set of plastic wheels that no one even remembers that we had!. 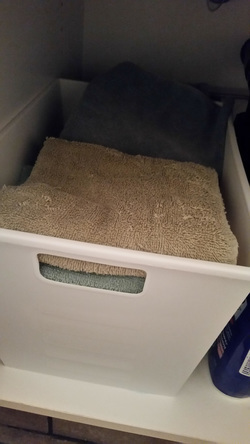 Now, aside from the two bins, all that is under there is a first aid kit and the bathroom cleaning supplies which consists of toilet cleaner and disinfectant wipes that I use to wipe off the counter and the sink on a daily basis. 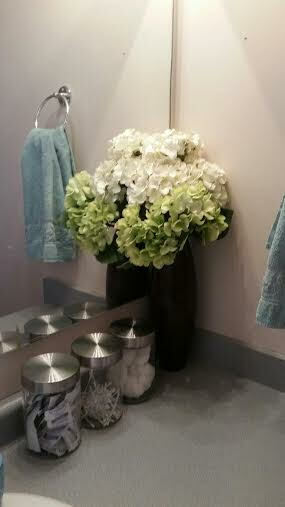 I try do a deep clean of the powder room and the bathroom once a week and a wipe down every day. As you can see around my sink, it's still a bit cluttered, but I have an idea that I need to work on a bit. More on that in a few minutes. First off, I just want to say that I am not what I would call an "elegant lady". Although I appreciate beautiful china, crystal, and gorgeous fabrics, you would be hard pressed to find anything like that in my home, except in my bathrooms. I use a cut glass decanter for our mouthwash and my toothbrush holder is a crystal beer glass. 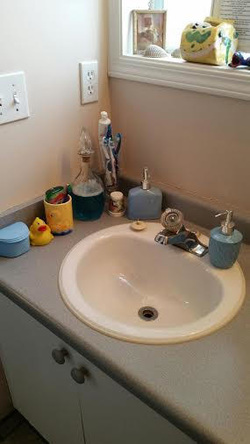 The duck cup and the rubber ducky is for our soon-to-be-three year old grandson.The square blue soap dispenser holds our moisturizer and the round one, of course, holds hand soap. Both were $1.25 each from a local dollar store. The most challenging part of the room, is a weird, triangular shaped shelf behind the toilet, which makes it super awkward to reach anything on it. The little stand with the drawers in it holds hair pins, elastics and small barrettes for my three year old granddaughter, who visits almost everyday. 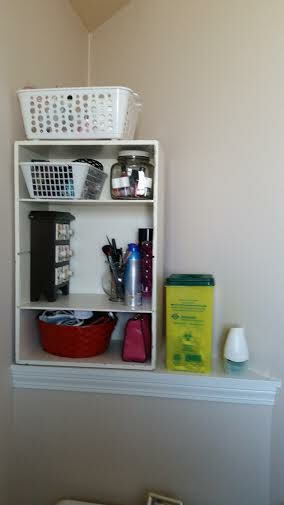 The other baskets hold my make-up, nail polish, and my hair items. The red basket holds my hair dryer and brushes. I do have a small bookcase that actually fits across that space and I am considering putting it up there and to hold everything. While I already had some of the baskets, the white ones were dollar store finds at $1.25 each. On the wall are two collage photo frames which were another dollar store find for $3 each. The photographs of the flowers are my own. They bring back memories of family, fun, and adventures with Mama Hen #1. I had them printed off at Wal-Mart when they had a great deal, each 4x7 print was 10 cents and it took an hour for them to be printed. I spent that hour of waiting for them, in the garden center planning my backyard makeover - but that's a story for another day.